Mango Lychee Naked Tiger: both of these 'exotic' fruits are grown in Malaysia so they should be able to mimic the flavour of both very well; and they can!! The sweetness of both combined with the slight sharpness of the lychee makes for a great vape. Mango Lychee Naked Tiger Is 60 ML of 70-30 (VG/PG) Zero Nicotine E-Juice. 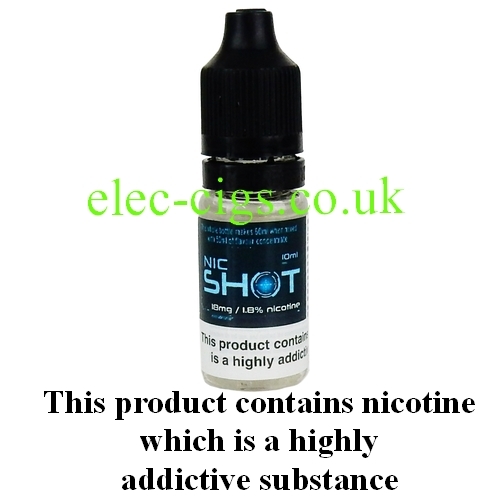 There are optional flavourless 10 ML Nicotine 'Shots' 18mg (1.8%) Nicotine. If you mix the whole bottle with one 'Shot' it gives you a nicotine content of a little less than 3 mg (0.3%) and when mixed with two 'Shots' the nicotine content increases to almost 6 mg (0.6%). Please note that the 'Nic Shot' supplied may not be the one illustrated but will be of an equivalent quality and strength. Mango Lychee Naked Tiger is not for sale to persons under the age of 18 years. You may be asked for identification to prove your age when your order is delivered. If purchased with the optional 'Nic Shots' this product contains nicotine which is a highly addictive substance.